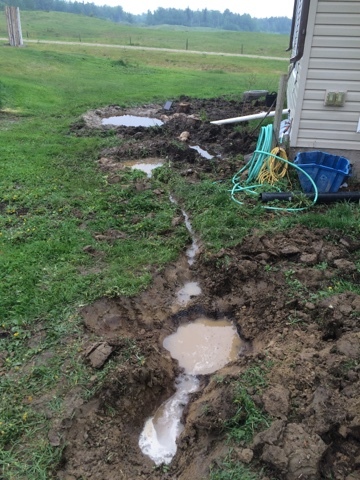 One of the main drivers of this summer's landscaping work is to improve the drainage on the west side of the house. There is a sump pump outlet on that side, and the water table is quite high so it runs regularly. 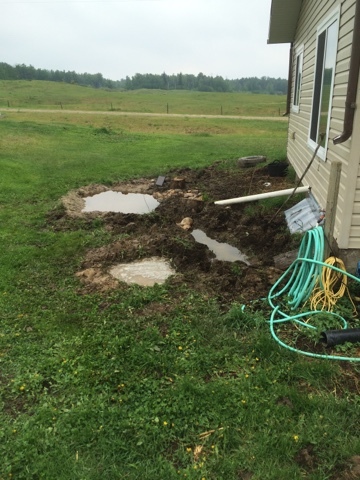 The drainage was not good enough to clear the water away from the foundation, so the sump pump ended up more or less recycling it. Over and over and over. I have tried a few things this year, and learned that it's essential that the outlet reach at least several feet from the house or else it drains into the window well and floods the basement (yeah, that was not a pleasant thing to learn). I also learned that there's rock solid clay about one inch down ... actually, I knew that, since most of our land is clay covered in a smidgen of topsoil, but this particular spot is absolutely SOLID clay. The kind that will not soak up water. The kind that makes natural ponds. Ponds attract birds, frogs, and dragonflies - all of which eat the mosquitoes that you probably think of immediately when someone says "pond". A pond with moving water and not too much plant cover will draw more predators than it will breed mosquitoes - you'll get more mosquitoes from boggy grass (which is what we had). So, I and my shovel got to work. 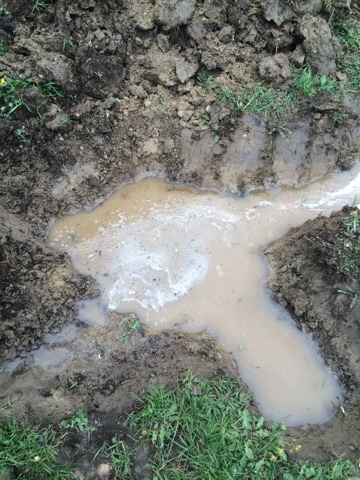 I dug a little stream bed and filled it with rocks, then dug out a big hole that's essentially a mini wading pool. The clay here was gorgeous - smooth and slippery and solid. I dug with the shovel, then just got in and scooped up gravel bits and such with my hands, using my feet to find the spots that needed more work. It was really cloudy and awful looking but by the next day the water had cleared! I watched it overnight, and it filled right up. Rain (and lots of it, thank heavens) was in the forecast for today, so I did some more excavation as my initial test pond proved successful. It does all look rather industrial at this point. I will be planting all around the edges with cattails, grasses and plants from down by the creek, and possibly some water lilies (permaculturisits: there are LOTS of edges!). Oh, and I'll definitely put in more willows. The whole area will be shelter for birds and other critters as well as providing flowers for bees - I've already noticed a dramatic increase in the number of birds and insects in the yard since starting the landscape design changes. I think all that fresh dirt and the puddles from watering the grass seed have made a worm buffet! We did get the forecast rain (which was especially welcome as the smoke from the fires north of here was making it really nasty), and the drainage is working as I had hoped! There will need to be more work done, of course ... the pondlet/stream north of the main pond needs to be tidied up and enlarged, I need to install some rain chains, and I will be extending the whole system down the hill to the pasture. 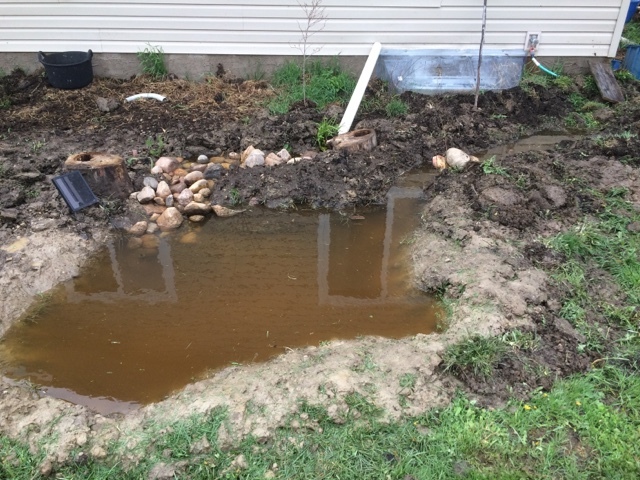 My goal is to have a little pond that is gravity filled from the outlet from our sump pump and rain gutters - the sump pump is going to run anyway, so it might as well do some of my work for me! Gravity is working with me, as there's a lovely steep hill going down to the pasture. I'll just need to make a little stream that runs down the hill and dig a pond at the bottom that the cows and donkey can drink from. No doubt Caleb will swim in it on hot days, too, especially since our creek seems to be almost dry. I think the beavers have been expanding their upstream domain again. See the red building in the top corner? That's the chicken coop ... I'll make a diversion from the creek to provide them with some water en route as well. The collection of logs and such is a 'water break' (sort of like a wind break, but for water) under the eavestrough opening. This is the first spot where I need to install a rain chain, to help keep the water coming directly down and not blowing sideways with the wind. Nonetheless, it's catching and moving the water where I want it to go. You can see that the little pondlet has overflowed and is making a soggy mess in the grass. That's what we used to have every time it rained - just soggy grass, which would sorta drain towards the pasture but only sorta. With all the grass roots and such, it moved too slowly to really clear. With a smooth clay creek bed, it should flow nicely down the hill. With the changing climate, holding water is getting to be more important: this is our first real rainfall of the entire spring ... we have had a couple of little sprinklings of rain but no major dumps from the sky. Hence the Fort McMurray fire and all the other assorted messes of this very dry spring. Having some water capturing features in the landscape will mean I can plant things that will be kept watered even if I am not paying attention, that birds and other little creatures can get a drink even when things are very dry, and I can dip a bucket in to water the chickens or other plants and such if I need to, without using well water. Seems like a good idea. Best of all, if I can keep the water away from the foundation, the sump pump will have less work to do (and thus a longer life span). There'll be less chance of the basement flooding. And the stock water should be automatically refilled for most of the summer, without any work from me. That's the plan, anyway. So far, the prototypes are working well so I am hopeful.